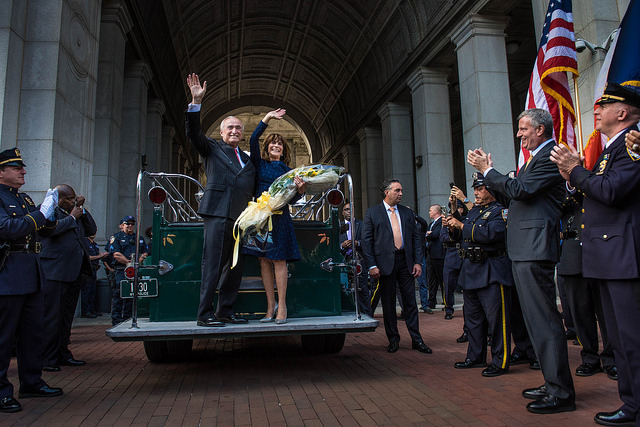 In an extraordinary send-off -- his own mini-parade -- Bill Bratton departed 1 Police Plaza on September 16, 2016 for the final time as NYPD commissioner. For about two-and-a-half years Bratton was Mayor Bill de Blasio’s police commissioner and the arrangement worked mostly well for both: Bratton had the job and power in it that he wanted, de Blasio had political cover on his most sensitive issue, and crime continued to trend downward, silencing (or at least quieting) some de Blasio critics. When Bratton announced his departure, few were shocked. It created a new vulnerability for de Blasio, but also came with a silver lining -- while Bratton gave de Blasio key political cover and got some key results that de Blasio needed, he was himself a political figure, prone to speaking his mind no matter what the de Blasio company line may have been, perpetually battling with the City Council, and the embodiment of his controversial brand of Broken Windows policing. De Blasio quickly replaced Bratton with then Chief of Department James O’Neill, who he attempted to label not as the broken windows commissioner, but the architect of the new neighborhood policing. In most quarters, Bratton’s legacy is as a top policing leader, one who continued to oversee crime drops in New York City even as there were 2016 spikes in other cities around the country, and, for some, despite working for a mayor who doesn’t get “law and order.” In other quarters, Bratton is known as the purveyor of an antiquated, racially-biased system of over-policing who did little to change overall NYPD culture or hold badly-performing officers accountable. Though Bratton did continue to implement broken windows, with its focus on strict enforcement of low-level crimes in order to prevent disorder and more serious crime, he and de Blasio also oversaw several significant policing reforms from 2014 through 2016. These included reductions in street stops and arrests for low-level crimes, including possessing small amounts of marijuana, a new training regime focused on de-escalation, and more. 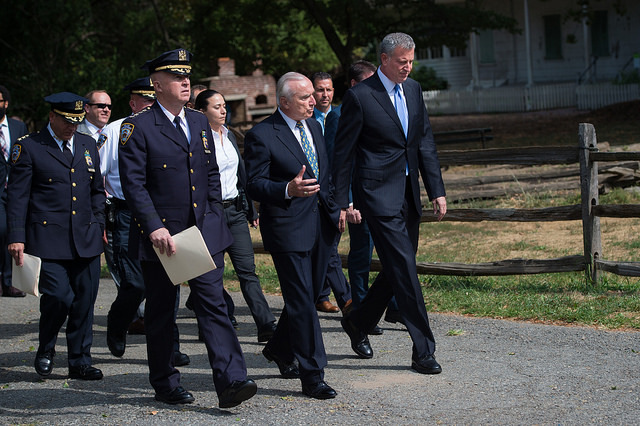 Under Bratton, de Blasio and the City Council agreed to add about 1,300 additional officers to the NYPD force. Bratton should also be remembered as the central figure who helped de Blasio get through his most challenging period thus far as mayor: the murder of two police officers in December 2014 and subsequent NYPD revolt, during which officers turned their backs on the mayor and then engaged in their own work slowdown. For several weeks Bratton was the voice and face of the administration, making a variety of local and national media appearances -- then and throughout his tenure, Bratton full-throatedly vouched for de Blasio. Under the leadership of Speaker Melissa Mark-Viverito, the New York City Council continued its progressive policy push in 2016. There’s perhaps no better example of this than the Criminal Justice Reform Act, which created an altered legal paradigm for enforcement of low-level nonviolent offenses like being in a park after dark, having an open container of alcohol, public urination, and more. Along with the CJRA, the City Council and de Blasio in 2016 moved through a variety of other policies that fit with their promise to create a more fair and just city. It is worth noting that on many fronts, including the CJRA, there are voices on the left saying they did not go far enough. But, in terms of moving city public policy leftward, there is the CJRA, along with other examples like new protections for freelancers and grocery store workers; expanding access to feminine hygiene products in city schools, shelters, and prisons; additional steps to make the city more environmentally-friendly; and more. Also at the City Council in 2016, pay raises for city elected officials were passed. This included raises for Council members, but also major reforms to the position of Council member, formally making it a full-time position and banning outside income, as well as eliminating bonuses for chairing committees. Mayor de Blasio saw a major legacy achievement pass in 2016: mandatory inclusionary housing, which requires certain percentages of affordable housing within new residential developments where an upzoning occurs. De Blasio and his City Council partners call this the most progressive zoning for affordable housing in the country, and it is an important piece of the mayor’s larger affordable housing plan. MIH, which passed in March, is only one piece of that plan, though, which is more focused on preserving affordable units (rental apartments with certain rent caps) than on building new ones. De Blasio’s administration continued to come to deals to preserve affordable units in 2016 and appears to be on pace for its goal of 200,000 units over 10 years. Neighborhood rezonings also come into play here, and the city passed the first under MIH and de Blasio’s bigger plan to rezone about 10 areas of the city with the East New York rezoning in April. New housing units, especially at the lower end of the affordability spectrum, can’t come online fast enough. While de Blasio and his allies are moving ahead with new and preserved affordable housing, homelessness continues to reach record highs in the city and as 2016 ends the mayor is regularly admitting that his administration needs to do more to battle the crisis -- which now includes about 60,000 individuals, almost half of them children, living in homeless shelters. De Blasio has promised more of a plan on homelessness early in 2017, but the issue has perhaps become his biggest policy failure. The mayor and his team are quick to point out that their rental assistance, eviction protection, and other measures have kept homeless numbers from reaching even higher heights. And, they correctly point to past and ongoing failures by others at the city and state levels on homelessness-prevention and affordable housing requirements that have contributed to an escalating crisis. Governor Andrew Cuomo has outlined a $100 billion infrastructure plan that dots the state in projects related to its roads, bridges, tunnels, airports, convention space, and so on. The governor ends 2016 on a victory lap for getting the first phase of the Second Avenue subway open (Cuomo will take an inaugural ride New Year’s Eve; it’s set to open to the public January 1), and tying it to his larger plan. When discussing his grand plans -- some of which don’t have full or transparent funding appropriations -- Cuomo talks of his ambition as a builder in grand, historic terms, claiming that he has led New York into a new era of thinking big after decades of small-mindedness. Cuomo’s focus on infrastructure is smart, as long as he can pay for it responsibly. Some want to see him invest even more in the MTA, given the problematic state of New York City’s subway system, which is rife with delays and overcrowding. The state is investing tens of billions into the MTA, but for Cuomo there are also new and sexier things to build, and other parts of the state to attend to. Cynics also see the governor’s infrastructure push as a helpful distraction from continued dysfunction in Albany and corruption in state government, including Cuomo’s own administration (see more on these topics below). Regardless, Cuomo knows that his infrastructure push will leave him with a physical legacy that few elected officials can claim. He may need re-election to a third term in 2018 to make sure that several pieces of his plan get executed as intended. Yes, this is still happening. As New Yorkers know all too well, Gov. 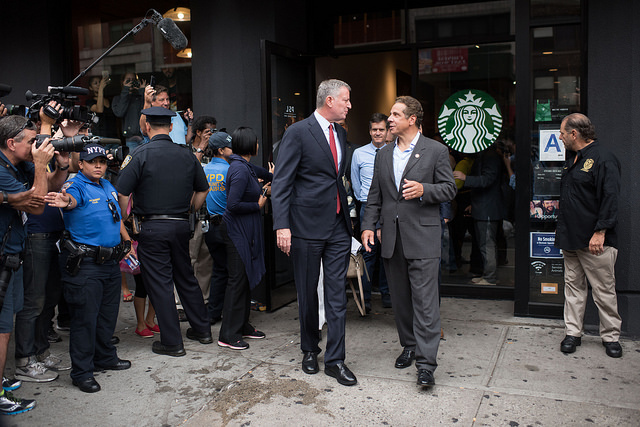 Cuomo and Mayor de Blasio barely speak to each other and don’t hold joint events, even when they should. They can’t bring themselves to appear at the same event unless absolutely necessary, and even then they go out of their way to avoid each other. While it makes for a few good jokes at the annual Al Smith Dinner (one of few occasions where they do share a dais), the two Democrats’ ongoing feud is not good for New Yorkers and makes both look petty and small. While de Blasio has made his mistakes in navigating the relationship, Cuomo continues to deserve more of the blame for the situation and appears to play a dangerous game in which he regularly leverages his governmental power to undermine de Blasio. The two have warred over a long-list of issues including funding for the MTA, CUNY, Medicaid, and affordable housing; homelessness policy; responses to Ebola and Legionnaires’ Disease; and much more. They even took their feud to the Democratic National Convention, where they called for party unity behind Hillary Clinton, while displaying none such unity themselves (again, this was more on Cuomo than de Blasio). Cuomo and de Blasio managed to take a joint tour of the site of a bombing in Chelsea earlier this year (pictured), but couldn't manage to hold a joint press briefing. Is there any hope for peace and reconciliation -- not to mention good, collaborative city-state governing -- in 2017? In a word: no. But, as 2016 ends the two have mostly settled into a ceasefire of sorts (their spokespeople continue to trade public barbs, but the electeds themselves have largely holstered their guns of late). Two key potential turning points loom on the horizon, though: the governor’s upcoming executive budget, which he’ll release in January, and the mayor’s re-election campaign. 2016 was the first full year in power for Assembly Speaker Carl Heastie, a Bronx Democrat, and Senate Majority Leader John Flanagan, a Long Island Republican. In 2015 they became two of the “three men in a room” in Albany, negotiating major budget and policy deals with Gov. Cuomo. Despite the new leadership -- Heastie and Flanagan took over for disgraced predecessors who are headed to jail -- state government continued to function in its typical fashion: minimal transparency, questionable budgeting, and major spending and policy packages passed in the middle of the night with little public review, even by rank-and-file legislators. Meanwhile, the two legislative chambers continue to disagree about how to address lawmakers’ ethics and campaign finance reform, with Senate Republicans unwilling to limit legislators’ outside income, close the infamous LLC loophole, or institute a public-matching campaign finance system like New York City has. Assembly Democrats, for their part, are against term limits and have done little to push budget and legislative negotiations into the light of day. New York was the center of the political universe in 2016, with both major party presidential candidates calling the state home, hosting their campaign kick-off events in New York City, and, as it all came to an end, holding their election night gatherings in the city as well. The result was not what most New Yorkers wanted, of course, as Donald Trump won the presidency despite losing his home state to Hillary Clinton, largely due to an especially wide margin in New York City. As New York Democrats continue to reckon with Clinton’s loss, they are also facing Trump’s win. Both Gov. Cuomo and Mayor de Blasio (each being discussed as a possible 2020 presidential candidate) have promised to fight Trump if he attempts to follow through on some of his most extreme campaign promises, each reasserting their version of New York values since Election Day. The president-elect has promised to freeze federal funding to so-called sanctuary cities, which are more immigrant-friendly, including welcoming undocumented immigrants, which could cost New York City about $7 billion in the next budget. However, it is not clear whether Trump would actually try to enact such a freeze or if he would be able to if he tried (legally, he would have to take different budget appropriations individually). Budgeting and policy tie together, of course, and as de Blasio has repeated regularly, it’s not really clear where Trump and his top cabinet officials will try to take the country, though they are likely going to attempt significant reconfiguring of health care, tax, immigration, and other major policy areas, all with significant impact on New York. Right now it’s both wait-and-see and try-to-influence Trump and other federal officials, with much hope residing in New York’s Charles Schumer, who will become Senate Minority Leader. Democrats not only thought this would be their year to win another presidential race, but to take over the state Senate here in New York, and thus all of statewide government. While we won’t know for sure until the new state Senate is seated and its rules adopted in early January, it is looking almost certain the Republicans will continue to control the 63-seat chamber, offsetting Democrats’ control of the Assembly. If the GOP does indeed control the Senate, it promises to continue to keep the brakes on some of the more liberal policies that Gov. Cuomo and other Democrats may be seeking in 2017, some of which are long-standing priorities that the GOP has blocked: the DREAM Act, Raise the Age, codifying Roe v Wade in state law. Others, perhaps even Cuomo if you gave him truth serum, argue that GOP control of the Senate helps keep balance to state government, including fiscal responsibility. As always, there’s a lengthy agenda for state lawmakers in the new year, including things like legalizing and regulating app-based car services like Uber, but the governor’s State of the State and executive budget will give more form to the initial negotiations. The state budget passed on April 1, 2016 included a $15 per hour minimum wage program with different phase-ins by region and paid family leave mandates, placing New York among the national leaders on both. While some conservatives balk at the potential damage of the minimum wage plan to businesses and overall employment, Cuomo made it his signature issue of early 2016 and sees it as a major legacy accomplishment. The wage is about to make one jump as the year ends. Meanwhile, the paid family leave program will begin to be phased in during 2018 and is seen as another leading progressive victory for Cuomo and his partners in government and beyond. More so than the minimum wage, Republicans are also celebrating the paid family leave policy. Scandal again rocked state government this year. But in 2016 it was less the state Legislature and more the Executive Chamber: top associates of and donors to Gov. Cuomo were indicted in an alleged scheme involving bid-rigging, bribes, and kickbacks largely centered on the governor’s Buffalo Billion economic development program. Among those charged are longtime Cuomo friend, aide, and enforcer Joe Percoco; the longtime head of SUNY Polytechnic Alain Kaloyeros, whom Cuomo worked closely with and heaped praise and power upon; and several major donors to Cuomo’s campaigns who won large state contracts. Cuomo has denied any knowledge of wrongdoing and has not been charged with any crimes. He has also made some changes to state practices and promised other reforms. They are moves that watchdogs call insufficient. Cuomo hasn’t announced support for restoring contracting oversight powers stripped from the state Comptroller or giving the Attorney General blanket power to investigate and prosecute public corruption (something Cuomo called for when he was AG). People close to Mayor Bill de Blasio just want 2016 over with. What started out a promising third year in office for the mayor quickly turned sour -- and largely stayed that way -- when a series of law enforcement investigations into the mayor and his allies came to light. While a couple of controversial items, like the Rivington House saga, appear to be behind de Blasio and company without charges of criminal wrongdoing, 2017 does not at this point appear to offer much respite from controversy. The New York Times recently reported that there are two different grand juries hearing evidence related to actions by de Blasio and his allies, one related to their involvement in 2014 state Senate elections and another related to whether donors to the Campaign for One New York were promised or received favorable government action. It is not clear whether de Blasio himself could be indicted, but anything short of no charges being filed against anyone will be extremely problematic for the mayor, and the city, given the distraction. Any time de Blasio and his aides are focused on legal issues and not their government work, the city suffers. De Blasio has maintained that he and his allies are innocent, that they not only followed the law, but also ethical guidance. Still, investigators appear to have at least found enough to assemble the grand juries (one state, one federal), and de Blasio and his team clearly at least blurred some ethical lines. Much of 2016 was dominated by the Rivington House mess, questions about the Campaign for One New York, which took in millions from entities with city business, and decisions made by de Blasio and his political and governmental teams. Those teams have also had blurred lines, with the now-infamous “agents of the city” designation coming to light this year, followed by many questions around de Blasio’s relationships with private sector consultants who regularly advise him while they work for clients with city business. How those grand juries and any other ongoing investigations turn out will have immense impact on de Blasio’s 2017, re-election bid, and life and career beyond. If the mayor can survive the proceedings, he’ll be a heavy favorite to be re-elected. That raises one other key story of 2016, not listed above: ongoing rumblings about who may challenge de Blasio. As 2017 begins, several big names (Scott Stringer, Ruben Diaz Jr., Hakeem Jeffries, Christine Quinn) are still on the sidelines. The City Council will pass a bill this week to put significant limits on the donations that political nonprofits aligned with elected officials can accept from entities with city business. 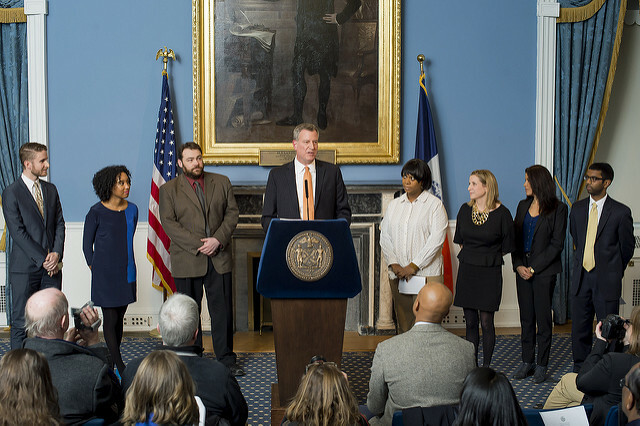 Mayor Bill de Blasio intends to sign the bill, sponsored by Council Speaker Melissa Mark-Viverito, into law. While she has been a close ally of the mayor, in crafting the bill Mark-Viverito condemned one of the most controversial aspects of de Blasio’s tenure, The Campaign for One New York. And in supporting the bill, de Blasio is giving at least implicit acknowledgement that there are problems with The Campaign for One New York’s fundraising practices. Created and run by de Blasio allies, the nonprofit advocacy group took in millions of dollars in donations from entities with city business, chiefly labor unions and real estate developers, leading to allegations of a “pay-to-play” culture and law enforcement investigations. During a Tuesday press conference, de Blasio did not directly answer questions from Gotham Gazette about his support for the bill and acknowledgement of problems with Campaign for One New York fundraising, instead defending the organization, which was shut down amid controversy. After the press conference, de Blasio’s chief spokesperson clarified that the mayor supports the bill because it helps get money out of politics. 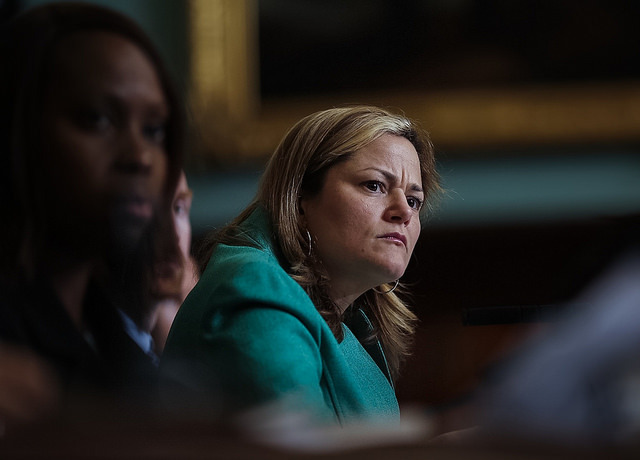 The new regulations outlined in Mark-Viverito’s bill would limit donations from those with city business “to non-governmental entities controlled by a local elected official or their agents.” The new limits will match those that are part of the city’s public-matching campaign finance system, wherein entities with city business can give only $400 to a candidate’s campaign. Thus, the bill the City Council will pass on Thursday and de Blasio will sign into law at some later date will create regulations that would have made the Campaign for One New York subject to much stricter fundraising rules, likely crippling its ability to raise the major sums of money that funded its main effort: a campaign to push for state funding of pre-K. A great deal of the money that Campaign for One New York spent went to political consultants close to de Blasio who ran the pre-K campaign. A spokesperson for Mark-Viverito confirmed that the bill shows a belief by the speaker that the way The Campaign for One New York did business was not appropriate and that it is important to put limits on the fundraising that such groups can do from entities with city business. The bill also requires donor disclosure, something de Blasio’s group did voluntarily. Mark-Viverito’s spokesperson said the speaker will address the bill on Thursday before it is passed. Mark-Viverito was not present at a November 21 hearing on the bill, despite being its lead sponsor. The Council’s standards and ethics committee will pass the bill on Wednesday before the full Council votes Thursday. The question of whether donors were promised or received government favors in exchange for their donations is the subject of ongoing law enforcement investigation. No one has been charged with a crime and de Blasio maintains that he and his allies acted legally and ethically. The city’s campaign finance system has it’s doing-business limit of $400 in place in order to reduce real or perceived conflicts of interest. On Tuesday, Gotham Gazette asked the mayor if by supporting much stricter donation limits to elected official-aligned nonprofits he is acknowledging that the way The Campaign for One New York’s did business was problematic. “No,” de Blasio said, before giving an extensive answer that did not really address the question. “I’m only acknowledging that it became a big distraction, even though everything was done properly and even though we achieved the goals we set out to achieve, which were the pre-K plan and the affordable housing plan, specifically the mandatory inclusionary housing legislation,” de Blasio said. “I have eyes to see if something becomes too much of a distraction you move on and you do other things,” de Blasio added, again giving his latest explanation for why he decided that The Campaign for One New York should be shut down (he originally said it was closing up only because it had accomplished its goals). While de Blasio did not answer the question directly, his spokesperson provided more clarity by email when asked. Gotham Gazette continued to push for an answer about support for the new doing-business fundraising limits signaling at least implicit acknowledgement that the extent to which The Campaign for One New York raised money from entities with city business was inappropriate. The question isn’t simply about nefarious intentions or not, it is about real or perceived conflicts of interest or undue influence that large donations to pet causes or campaigns can have on city officials. These are the reasons behind the $400 doing-business limit on candidate campaign donations. “He’s supporting it because he supports getting money out of politics,” Phillips wrote. The bill will be discussed further on Wednesday and Thursday at the City Council. Mark-Viverito was in attendance for much of Tuesday’s press conference as de Blasio announced a new program to boost the life sciences sector in New York City. She left before the “off-topic” section of the press conference, where members of the media ask the mayor questions about a variety of issues. “We have a special obligation in New York City,” Mayor Bill de Blasio told New Yorkers from The Cooper Union on Monday, giving a formal speech to reassure and rally the city after the election of Donald Trump as the next President of the United States. De Blasio indicated that he had decided to give the speech because of all the fear that Trump’s campaign and election had created. More than two years ago, in April 2014, de Blasio spoke from the same Cooper Union stage, delivering remarks “on New York City’s future” to mark his first 100 days as mayor. Monday’s speech had a far less celebratory tone, though the mayor hit similar points. 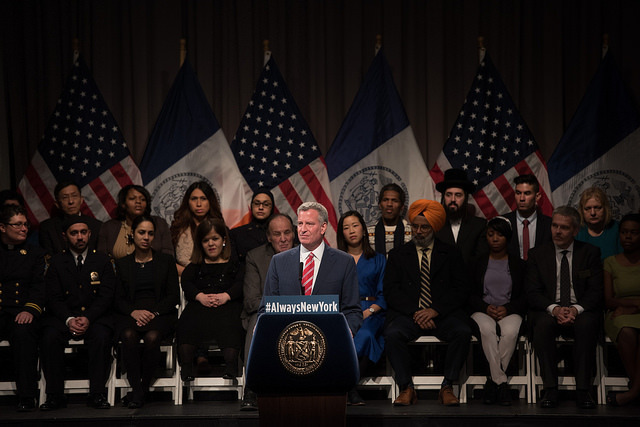 This time, the organizing theme was "Always New York," with de Blasio highlighting the city's place as a world leader and its long-time progressive principles. In essence, de Blasio attempted to do three things with what was a 40-minute speech Monday: define New York values; promise certain steps from his administration in the face of potential policies from a Trump administration; and call on New Yorkers to take specific actions to help lead the resistance. Citing a “sense of foreboding,” the mayor promised unity and New York City as a beacon of what is good and right in the world. De Blasio said he was deputizing New Yorkers to fortify the city against what he described as threats of division from President-elect Trump. The mayor made clear that he was responding to Trump’s election and referred to “the president-elect” several times, though only said Trump’s name once from the hall that has been host to many famous orators and speeches. “I always believe the people will help to correct the mistakes of leaders,” de Blasio said. 2. “We need you to help your friends and family members sign up for health insurance under the Affordable Care Act right now,” the mayor said. Earlier in the speech he acknowledged concern among New Yorkers who are registered under the ACA, or Obamacare, of a repeal of the law and loss of health insurance. De Blasio did not explain why this is important to do, but it appears the thinking is that the more people insured through the ACA, the harder it would be for the federal government to justify repealing it. 3. “We need everyone to register to vote,” the mayor said. De Blasio highlighted that his preferred presidential candidate, Hillary Clinton, was ahead in the popular vote by about 1.5 million votes, but that Trump had won through the Electoral College. The mayor has recently taken up voting and election reform in New York, calling on the state government to pass early voting, same-day registration, and other changes. The mayor says he was spurred to get more vocal about the issue by the Bernie Sanders movement and problems with the city’s election administration, including long Election Day lines. It is not lost on anyone who watches closely that the mayor is up for re-election next year. De Blasio, who is not religious himself, regularly speaks at churches and other houses of worship and at religious events. He spoke at two churches on Sunday, in fact, and at Ohel Children’s Home and Family Services’ 47th Annual Gala. During his Monday speech, the mayor discussed a recent trip to a mosque, which he said gave him hope. 6. New Yorkers must speak up against acts of hate and bias, the mayor said. He connected it to “If you see something, say something,” the call to keep an eye out for possible criminal or terrorist activity. “The NYPD is ready to act. The Human Rights Commission is ready to act. If you see someone in danger because of a bias attack, call 911. If you have information about acts of hatred and harassment and hate speech, call 311. But whatever you do, call, so we can get to work stamping out all hatred and bias in this city,” de Blasio said. There has been a wave of hate crimes across the city since Election Day, prompting a variety of rallies, marches, and other actions in response. Governor Andrew Cuomo gave a speech at a Harlem church on Sunday and outlined new steps the State was taking, including a new hate crimes unit in the state police. Cuomo had already announced a new hotline to report hate crimes. 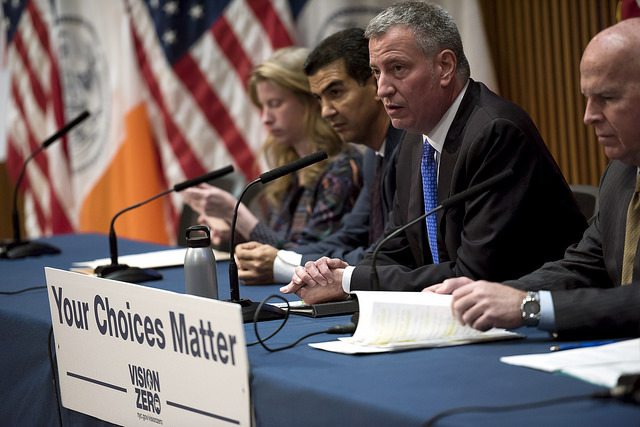 New York City’s municipal party primary elections are ten months away, and though he does not yet have a formidable challenger in the race, Mayor Bill de Blasio is not sitting back unprepared. De Blasio, a first-term Democrat, has kickstarted his reelection campaign, raising funds and formulating a campaign message around his achievements. In part, he is trying to preempt a significant challenger from entering the fray. But, as de Blasio himself has said, being Mayor is a 24/7 job and throwing an electoral campaign into the middle of it presents challenges. One major challenge de Blasio faces, and in unique fashion to his three-term predecessor, is balancing his time spent governing versus campaigning, while also adhering to conflicts of interest rules for all city employees. De Blasio explained the challenge of finding time in his nonstop workday, one that begins around 5:30 a.m., he said, and includes consistent emails and calls until he goes to bed around midnight. Asked if he was dedicating any specific blocks of time, de Blasio said it wasn’t really possible to do so. De Blasio is the first incumbent New York City mayor seeking re-election without self-financing his campaign since 1997, when Rudy Giuliani won a second term. Former Mayor Michael Bloomberg bankrolled all three of his campaigns, thus needing to dedicate far less time away from his government duties during his two reelection bids, given that fundraising is both time-consuming and essential. 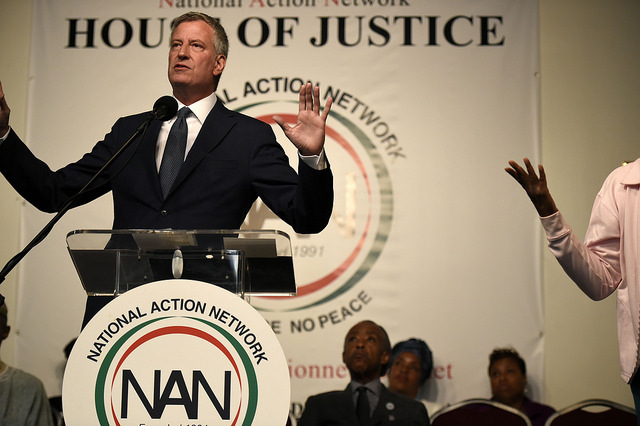 On that front, de Blasio has emphasized a return to his roots, shifting to a small-dollar fundraising operation akin to what Vermont Senator Bernie Sanders employed in the race for the Democratic presidential nomination. De Blasio has hired the same digital fundraising firm, Revolution Messaging, that ran Sanders’ operation, famous for the $27 average contribution that the senator liked to boast. It is also an apparent attempt by de Blasio to diminish the negative attention he received for his fundraising for the Campaign for One New York, a political nonprofit that promoted his agenda while taking unlimited contributions, that has since become the subject of multiple local, state and federal investigations, and is in the process of shutting down. Neither the mayor or any of his allies involved have been accused of wrongdoing and de Blasio has insisted they acted legally. The mayor has repeatedly said he sought and followed appropriate guidance from the city’s Conflicts of Interest Board. It is that same board that provides guidance around separating government and campaign activities. Without more clarity on the mayor’s schedule, it is unclear how well he is limiting his fundraising time. But, it is apparent that the mayor is making many fundraising calls and attending a variety of fundraising events already -- he appeared at a small-dollar young professionals fundraiser for his campaign in Harlem Wednesday night; on November 15, he’ll appear at a fundraiser in Southeast Queens hosted by City Council Member Donovan Richards. Previously, de Blasio has attended a variety of other small fundraising events and had a large fundraiser at Brooklyn Bowl, at which comedian Louis CK, an outspoken supporter of the mayor, performed. Closer to reelection, de Blasio has stepped up his public outreach from a government perspective, too, hosting a number of town halls across the city. He also recently added a new weekly appearance on NY1’s Inside City Hall to his schedule. On the inaugural show, on October 31, anchor Errol Louis also asked the mayor about his fundraising schedule. De Blasio’s campaign spokesperson said questions about the mayor’s time management should be directed to City Hall. A spokesperson at City Hall then referred Gotham Gazette to the NY1 interview. The city’s campaign finance laws and the City Charter place restrictions on when, where, and how an elected official might indulge in campaign activities, to ensure a separation from their official duties. The Conflicts of Interest Board also issued a general advisory in 2012 after receiving numerous questions from elected officials on how they and their subordinates may engage in political activity. By law, no elected official is allowed to use city resources for campaign purposes or work on a campaign while on the clock. For instance, in the mayor’s case, he would be prohibited from making campaign-related calls out of City Hall. There has already been one possible indication of that separation being tested. A few weeks ago, after the mayor hurriedly took a helicopter from Prospect Park in Brooklyn to an event in Queens to avoid being late, his city spokesperson would not confirm the purpose of the meetings that delayed him in Brooklyn. As has been widely reported, the mayor frequents Bar Toto nearby for political meetings and to make fundraising phone calls. The Wall Street Journal reported that the mayor often spends his Fridays at the restaurant. “Any incumbent who is running for reelection needs to find time within the day to do the politics of this and the mayor is no exception to that,” said Dadey of Citizens Union. Although, the mayor is the first citywide elected to have begun to campaign outright for the 2017 cycle. The other two citywide electeds, Public Advocate Letitia James and Comptroller Scott Stringer, have not been especially active on the campaign trail, though both are raising some money. A spokesperson for James declined to comment for this article. Inquiries to Stringer’s office went unanswered. James has a fundraising event coming up November 16 at a Manhattan restaurant. What also puts de Blasio in somewhat challenging territory is that his situation is again so different from his predecessor, and many New Yorkers weren’t around for Rudy Giuliani’s tenure and re-election campaign. “Mayor Bloomberg spent no time dialing for campaign dollars or hosting fundraisers,” said Patrick Muncie of Tusk Strategies. Muncie worked on Bloomberg’s 2005 and 2009 campaigns and served as deputy press secretary in the mayor’s office. He is also involved with NYC Deserves Better, a group aimed at unseating de Blasio next year that is run by Bradley Tusk, who ran Bloomberg’s 2009 campaign. Bloomberg spent over $100 million that year to narrowly win his third term. There are few people Mayor Bill de Blasio trusts when there is a lot on the line. One of those people, Phil Walzak, has been a top aide to the Democratic mayor since de Blasio’s 2013 campaign, for which Walzak was communications director. This past week, de Blasio’s reelection campaign announced that Walzak is moving from City Hall -- where he had been de Blasio’s press secretary then senior advisor -- to the campaign. When it comes to a Mayor seeking a second term, there is certainly a lot on the line, and Walzak will be “overseeing the 2017 campaign’s communications planning, and developing and implementing the strategy that will drive the re-election effort,” according to the campaign. But, the move comes somewhat early in the campaign cycle -- the Democratic primary is 11 months away and no candidate likely to pose a significant threat to the mayor has yet declared a run -- and de Blasio said on Wednesday that he does not plan to replace Walzak at City Hall. This combination of facts shows de Blasio prioritizing the work of his campaign over the work of his government. Over his nearly three years as Mayor, de Blasio has himself repeatedly cited a need to improve his communication, which has been criticized from in- and out-side government. Walzak is one of three press secretaries and two top strategic advisors de Blasio has employed as he has attempted to find the right approach to both the media and direct outreach to New Yorkers. Early in his term, de Blasio’s press office was slow and timid, and the mayor was criticized for talking too infrequently to local outlets and to New Yorkers -- he relished national media attention and it took him nearly two years to hold his first town hall as Mayor. Recently, de Blasio has taken heat around how infrequently he holds press conferences, for limiting the topics during the ones he does hold, for being confrontational with reporters, and for lashing out at the New York Post while refusing to take one of its reporters’ question. Walzak and other top advisors to the mayor -- some in government, some outside -- have influenced de Blasio’s approach to communications, though the mayor is known for trusting his own instincts and overruling the advice of others. When Gotham Gazette asked de Blasio if Walzak had served him well in light of the mayor’s admitted communications challenges, de Blasio was vehement in the affirmative. It may be that de Blasio currently feels better about his press office and communications by City Hall -- the office became more organized and responsive to reporters under de Blasio’s second press secretary, Karen Hinton; the communications team has been creating more original content and focusing on social media; and the mayor has been more regularly holding town hall meetings across the city. De Blasio’s current press secretary, Eric Phillips, is the sharpest of the three he’s had, possessing strengths of Walzak and Hinton as well as others. However, it is not clear why de Blasio feels at such ease moving Walzak to the campaign at this stage and not replacing him -- two follow-up emails to Phillips seeking further explanation of the move were not returned. Last week the Wall Street Journal reported that one reason for the timing of the move was to help dissuade potential challengers from running against de Blasio. With Walzak gone from City Hall, it is not immediately clear who will step into the void, if anyone. Walzak is one of few people often involved in the mayor’s biggest decisions and most sensitive matters. He speaks to members of the media, both on and off the record, for de Blasio, including occasional appearances on television and at public forums. De Blasio is in the midst of major governmental strategic and communications efforts, essential to his record: assuring New Yorkers that he is truly reforming the NYPD; convincing elected officials and communities to accept land use rezonings and new development in an effort to build more affordable housing; gaining more support for his education agenda; and more. De Blasio has other top political and communications aides -- Emma Wolfe, Andrea Hagelgans, Phillips -- and advisors not on the city payroll, including several individuals so close to the mayor that his administration has determined them to be extensions of City Hall, and their communications with the mayor shielded from public disclosure. They include several people who, along with Walzak, helped the mayor win his 2013 campaign, such as former campaign manager Bill Hyers and consultant Jonathan Rosen. The City’s determination to withhold de Blasio’s communications with those outside advisors, termed “agents of the city” by de Blasio’s former counsel Maya Wiley, is the subject of a lawsuit filed against the City by NY1 and the Post, which sought the mayor’s emails with those ‘agents’ through the Freedom of Information Law. As de Blasio approaches the final months of his third year in office and then his reelection year, both his government work and his campaign will be under intense scrutiny, though that is nothing new. “City Hall is a meat-grinder” according to a top strategist who knows de Blasio well and spoke about his communications approach on the condition of anonymity. “The mayor is under immense media pressure, unlike any other mayor,” the strategist said. “The market is different than it’s ever been,” the strategist explained, referencing the competition, social media, and the speed of news cycles. A bill introduced by City Council Member Dan Garodnick to require the NYPD to publish its patrol guide online will be heard for the first time by the City Council’s Committee on Public Safety next week. The hearing, set for Thursday, September 15, follows shortly on the recent controversy over the Right to Know Act, a package of police reform legislation that Council Speaker Melissa Mark-Viverito put on the backburner in favor of related changes the NYPD agreed to implement through training and its patrol guide. The compromise struck between Mark-Viverito and NYPD Commissioner Bill Bratton upset some Council members and police reform activists, while also drawing renewed scrutiny to the NYPD patrol guide. While Mark-Viverito has insisted the Right to Know Act bills are not off the table permanently and some call for Council members to push for their passage without her agreement to schedule a vote, Garodnick’s patrol guide bill is moving forward, and appears to have widespread support. After being heard in committee the bill can be amended and then voted through committee and the full Council - if it has enough support. While police and government reform advocates alike call for more transparency around police officer conduct, publishing the patrol guide online may be one fairly simple measure that most, if not all, stakeholders can agree on. The NYPD patrol guide lays out procedures and codes of conduct for police officers, including protocols for interactions with the public. Free but outdated versions of the guide are available online. In 2014, Shawn Musgrave, a reporter for MuckRock, obtained a copy through a Freedom of Information Law request, albeit after significant back and forth with the department. (Local writer and political organizer Keegan Stephan also posted the same version on his blog in April this year.) The current guide can also apparently be purchased online, at this officer uniform store and through this publisher, for between $55 and $70. Garodnick’s bill, introduced in March of 2015, would require the police department to make the full patrol guide available on their website free of cost, but would exclude portions on non-routine investigative techniques, confidential information or any information that would compromise an officer’s safety or that of the public. The police department would have to update the guide each time an amendment is made, clearly noting the changes along with their effective dates. The bill would go into effect 90 days after it is signed into law. Garodnick called his bill an “important transparency initiative” for the police. “This bill will help build the trust that some feel is lacking between the police and communities,” he said in a phone interview with Gotham Gazette. “It will also add accountability because New Yorkers will be able to know what to expect in interactions with the police and be better equipped to speak up” if there are any violations, he said. It will also help the police department, Garodnick said, in ensuring that the public understands the rules. Mark-Viverito appears to be backing the bill. “This is part of our continued push to reform the NYPD to make it more transparent,” said Eric Koch, spokesperson for the speaker, in a statement. Publishing the patrol guide is unlikely to quiet those calling for passage of the Right to Know Act, but it would bring more light to the new directives being given to officers for carrying out street stops, among other updates that have recently been agreed upon, such as the use of civil summonses instead of criminal summonses or arrests for a variety of non-violent, low-level offenses. Incoming Police Commissioner James O’Neill, who will take over the department when Bratton departs, has said he is fully supportive of the Right to Know compromise. The legislation in the Right to Know Act would require police officers to identify themselves by name, rank, and command if a street stop does not result in an arrest and requires an officer to obtain consent to search a civilian, a vehicle or house and inform a civilian of their right to refuse consent for a search if there is no probable cause. The bills were strongly opposed by Bratton on behalf of the NYPD, and thus the de Blasio administration. Mark-Viverito did not agree to schedule a vote on the bills, which had a committee hearing on June 29, 2015. Instead, Mark-Viverito struck an administrative compromise with Bratton to implement aspects of the two bills through department training and the patrol guide. In a recent interview with Gotham Gazette, Mark-Viverito defended the compromise as progress, explaining that the Council had moved the NYPD from its strong opposition toward middle ground. Police reform advocates have criticized the agreement, pointing out that the NYPD is particularly opaque when it comes to its patrol guide. “Editing training and patrol guide language will never deliver real change on the ground to end the police abuses that the Right to Know Act would help end, and the Speaker’s deal to gut and seek delay of the reforms certainly will not,” said Anthonine Pierre, lead community organizer for Brooklyn Movement Center, in a statement. Brooklyn Movement Center is a part of Communities United for Police Reform, a coalition. “Transparency is needed on a range of fronts with the NYPD and Council Member Garodnick’s efforts to advance that regarding the patrol guide are positive, but it’s troubling that this transparency bill was not provided with a hearing until public scrutiny of Speaker Mark-Viverito’s deal that lacks transparency and deficiently relies on the patrol guide,” Pierre said. There is no evidence that the hearing comes as a result of the Right to Know Act compromise. Amid the criticism of the deal, Politico New York recently reported that the NYPD was speeding up its estimated timeline for implementing the compromise by six months. According to Politico, NYPD sergeants were to receive training on updated search protocols as early as August 26 and would relay that to officers in the next few weeks. A second “reinforcement” training was planned for September, with the department expecting the patrol guide to be updated by October 15. At a recent news conference on the steps of City Hall, government reform group Citizens Union pointed to the lack of transparency with the patrol guide. The group released a set of proposals to improve police accountability; among them, making the patrol guide freely accessible to the public. Lancman expects the hearing to go smoothly and that the bill will receive overwhelming support. “There’s no reason the NYPD shouldn’t be transparent in this way,” he said. Below the audio is the full transcript of the interview. Let us know what you think: email Ben at bmax@gothamgazette.com or find him and Gotham Gazette on Twitter @TweetBenMax and @GothamGazette. Ben Max (BM): Speaker Mark-Viverito, thank you for joining me. 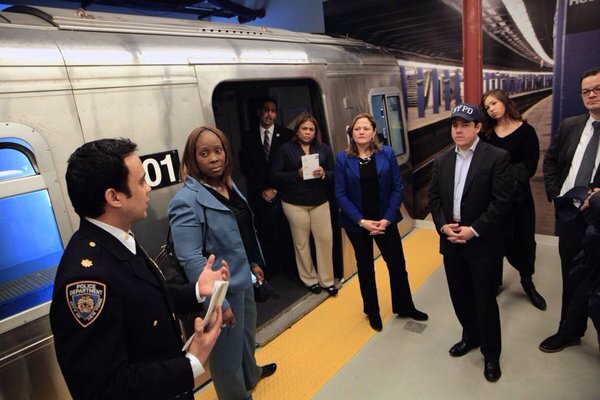 City Council Speaker Melissa Mark-Viverito (MMV): Thank you. BM: I wanted to first ask you about a couple of recent dust-ups of sorts, where you had a couple funny or interesting, not necessarily funny, but public moments. One is the Twitter exchange with the Department of Transportation. Tell me, tell us, when you reported something, you were tweeting, you’re active on Twitter, you wanted to bring something to the attention of a city agency, you didn’t get the response you wanted - so what went through your mind there? MMV: Look, I can probably tell you how many times a day, whether in person or through phone calls, constituents call our offices with complaints they’ve filed to 311 that don’t get addressed, and that our goal, as an elected official, and that is what we’ve been entrusted to do, right, is to be able to facilitate and cut through the red tape of the bureaucracy, and that is our responsibility. It’s not like we’re asking for more and better attention than others, but that comes with the responsibility of being an elected official that passes the budget for the City of New York and that our responsibility is to interact on a daily basis with city agencies to facilitate projects on behalf of our consistents and our districts. So, if I’m directly, as the elected official, interacting with a city agency to say this is something that is a problem in my district - I’m not asking for a personal favor - I’m walking the streets of my district, a light is hanging loose, which could be a danger potentially, also, right by a public school, kids walk that every day with their families, and it was hanging precariously, and I’m saying, this is something that should be addressed, then I don’t expect a bureaucratic response, that’s the reality. So, I did it in a way - I do a lot of walking in my district, I like to take walks to different neighborhoods of the City of New York, I’ve been doing a lot of logging these days of miles and you can see it on my Instagram and Twitter, and I like to interact with the neighborhoods that we represent as a way of getting a feel for it. But through one of those walks, checking out different things in my district, that’s what I came across. So that was the reason that I decided to tweet about it - to say please be aware of this, please do something about it. So, you know, it got a little bit heavier than it needed to, I think, but I’m glad that it got addressed, and I’m glad that the Department of Transportation paid attention to it and that it got resolved. MMV: Right. And maybe, obviously with the 140-character limitation on Twitter, sometimes maybe the tone, right, may be read in a different way. I think anybody who knows me and knows the way that I’ve carried myself, and that I carry myself, the last thing from my mind was entitlement. That’s not the approach and that was not the reason that I tweeted it. But as an elected official, on behalf of my constituents, we are asked and our responsibility is to interface with agencies and to get a quicker response and to cut through the red tape, and we do that every day very gladly for our constituents. So, it just may have been interpreted the wrong way, it definitely was not the intention. BM: So someone manning one of those, any agency Twitter account sees an elected official bring something to their attention, you want it to be maybe a little bit more of a flag than a normal constituent. MMV: Well I think the other issue here was, and that’s where we’ll probably do a hearing, is: how are complaints being logged from different city agencies. People use social media very aggressively these days. Other cities have been able to really incorporate that as a way of logging complaints. It seems like we may have some deficiencies in that. So that could be something that we really do a hearing on. We’ve talked about, how do we log complaints as a city, how do we address those complaints, how do they get resolved. So that’s more than anything, I think also part of the response that I handed out, right, is that I’m using a media, I’m logging a complaint, to me this was a way of logging a complaint, and the response was, ‘no, that’s not enough, you’ve got to go to 311 and get an official number, or however it is. BM: Right. I do think that brought to people's’ attention that they don’t seem to be taking complaints through social media, which like you said could be an interesting topic to sort of bring people in about. MMV: Right, and when it comes to New York, understanding that we’re at such a different scale than any other city. If you’ve got a city that’s 750,000 to a million people, it’s a little bit easier, maybe more agile, to get things done. But, we’re a large city, and understanding that sometimes some things may take a little longer to implement. But, because a lot of people do use their smartphones these days, for almost everything, should not the smartphone be a way also through either social media or other apps - I know that 311 has an app, we could talk about that, too, at the hearing. - but other ways that we can make sure that we’re addressing constituent concerns in a speedier way, a more expeditious way. BM: So that hits on oversight, and I want to sort of come back to the Council’s role and your role in oversight in a minute. But the second thing was, you were sort of defending your decision on the Right to Know Act compromise, and you were saying just because a bill has a certain number of sponsors even if it’s most of the Council, doesn’t mean [snaps fingers] it gets passed. MMV: Right. Because I mean there’s hearings that have to happen. Many times a bill as originally heard has to go through amendments. Things may be taken out, things may be added in. That’s part of negotiation or of compromise. So it’s not just there’s a lot of analysis and thought that goes into a bill, this is now something that’s going to hang over our heads as a city. So it’s not just a matter of saying ‘the magic number is 36, get it passed,’ there’s still a lot of legwork that has to go with it. And so that was really kind of the response, I mean we have to be very deliberative, we’re a legislative body, and we have to be really thoughtful about the things that we do and we have to take every opinion into account. I mean at least on the spectrum - people that are in favor, people that are opposed, people that are middle of the road. All those things weigh in to any decision that we make, and we have to hear those different points of view. And a lot of times, even I as a Council member, I would adjust based on information that I was getting that I hadn’t necessarily heard of. So it’s part of a process that sometimes with issues that may be a little bit more contentions or complicated, takes longer to get through and to sort through. So I just try to really - I take my responsibility very seriously, and I think all of us as legislators do, so that’s part of the process into any sort of legislation. BM: So is it your job, would you say, as Speaker, to be the conduit sometimes between the administration and the members, where you have to say, ‘there’s other considerations we need to take in here,’ and you’d go to Council members, where there’s however many, 30 or so, who like the intent of a bill, so they’re signed on as sponsors, but that doesn’t mean they’ve analyzed every word of the legislation, and you need to be, sort of the leader of the ship, right, the captain of the ship, and you need to say to them, ‘I don’t know that we’ve looked at this carefully enough’ or ‘we have to take this feedback in from the administration,’ how does that work? MMV: Look, I come into this position having been a Council member for eight years. And this was also part of the Speaker’s race, which I’ll get to in a minute. So you have a friend or a colleague that comes to you and says, ‘I need you to support my bill.’ And you may not have read every aspect of it, like you’re saying, the intent, ‘oh that sounds great, I know Robin, I’ve worked with her really well, I’m just going to sign on,’ right, and that’s a reality of the work that we do, where sometimes you’ll have an advocacy group that calls you and you’ve had a good working relationship and you sign on. But that’s where the hearings come in, right, and the deliberations, and hearing from other points of view. And then you may adjust - I know I adjusted many times when I was a Council member. So I understand that reality and so as Speaker I have that and I’m informed by that as well, and then when I spoke in the Speaker’s race, we made some reforms to really open up the body, and so the idea here is that it’s about being more thoughtful about bills you sign onto and how we move them forward. That’s part of it, and I’ve come with that understanding, which someone outside of the legislative body may not understand all those nuances. Part of the job is also getting and taking the criticism. Understanding that not everybody has all the information and maybe making a decision or judgement lacking the full context. And that’s part of it - you develop a thick skin, you’re able to move on, you do your work, you’ve got to govern, you can’t get too mired in that, and just figure out a way that we advance and make progress, which is at the end of the day what I feel I’m here to do. We want to move forward. Maybe for some people the pace may be slower than they would like, but my perspective or my philosophy is that if we’ve moved the gauge forward - 5, 10, 20, 50 percent - I feel we’ve made progress and I think that’s something I would be proud of. BM: Have you had to be more moderate as the Speaker than you were or would be as a rank-and-file Council member? MMV: I don’t think so. I believe I have to be more thoughtful and I have to be more balanced in being able to hear other perspectives and maybe take things a little bit more slowly or measured or try to figure that out. But I believe that what we’ve done, the work we’ve done is extremely progressive as a Council. We’ve taken on some issues that we’ve gotten a lot of national attention on; that we’ve really challenged, when it comes to immigration reform, criminal justice reform. I don’t think we get enough credit for the actual changes that we’ve been able to implement and how we’ve been able to move the agenda forward. So I think that I’m really proud of that, and understanding that as the leader of this legislative body, there’s more that I have to factor than just my personal point of view, or my own district’s point of view - I’ve got a city to also look at, other districts that may be a little bit more conservative than mine, other factors that play into it; that also we have to lead and govern making sure all those voices in some ways are being heard. BM: So that’s the difference between a citywide responsibility and your district? MMV: Yeah, and a more parochial, local perspective. BM: You say you don’t think you’re necessarily getting enough credit. From who? Where is there not enough credit? MMV: Well, I don’t think enough - that people when they talk about the criminal justice reform work that’s happened, they don’t really look at the breadth of what we’ve done, right - the bail reform work that we’ve done, the Criminal Justice Reform Act, and the way we look at summonses, and other things that we’ve taken into account or done that really is making a difference and will make a difference in people’s lives. And I’m really excited about that. I’m going to leave here with a record, I think, of real progress. BM: Is that the press? Is that the activists? Who? MMV: I think it’s a mixture of both. I would say that that’s the case. We do a good job, I think, of putting out there, and the press team has been great, really putting out there the great work that we do. How people interpret that or how people report on that is up to them. But, I think that we’ve done some really great work. BM: So on one hand there’s a lot of criticism, you mentioned, right. On the other hand there’s sort of people not necessarily giving quite giving enough credit for what you’re doing as a reformer. So, how do you take that. You get hit from the left and the right, right? You get hit from the activists - there’s a lot of pushback right now on this Right to Know Act - there’s new letters being sent and comments from family members of people who’ve been killed by the NYPD, and to me, I see that and I say, ‘Wow, if this Speaker is moving the ball in several ways, but these are still the criticisms that are coming from the advocates and reformers outside of government,’ how does that sit with you - how do you respond to that criticism? MMV: Listen, these families have gone through a horrific reality. Something that nobody wishes on anybody. Obviously there’s pain that never goes away, and those voices, they have the right to express themselves, and in some cases justice needs to be served. So, you take that, you listen to it, you interact, more than happy to engage with the family members. But it’s part of the deliberative process, it’s part of getting that feedback on anything we do, we’re always going to get people that may not agree exactly with it, but I’ve been very clear and anybody that knows me, I’m probably one of the least political people that you’ll meet, in the sense that I really do something, especially something as sensitive as this, something that I’ve worked so hard on and something that I’ve been involved in as a Council member, something that impacts my district directly, and that we hear a lot of it as well - it’s something that I believe in my heart is that the way we’ve approached it is the right way for now. And I’ve been very clear, that from a place where the NYPD indicated that these were ‘anti-cop’ bills to the point now that they are incorporating and putting forth elements of these bills, to the point where we’re going to be seeing it implemented on the ground - I want to see that play out, and legislation is not off the table, right, let’s see how it works out and let’s how it moves forward, and if we don’t feel progress enough has been made, then we can look at other alternatives. So, I’m very clear, I’m transparent about where I am, but I really believe that we have moved the ball forward in this case, and that we will see the results of that soon enough. They have time, they have to implement it, we can watch it, we can monitor it, we can have a hearing about it, see how it’s going, and then figure out the next steps after that. BM: On the other side of things - criminal justice reform, a lot of the sort of workplace and workforce-related reform, some of the immigration reform - you get people whether it’s in The New York Post or just sort of people from the right, who, you know: ‘this is communist stuff’ and this is, ‘the city is going to hell’ - and this is aimed at you, this is aimed at the Mayor - so do you worry at all that you’re going too far? Do you worry that you’re infusing government too much into the private sector? What do you think of the sort of critique from the right that this is all a little too much? MMV: In what ways, right? We’re two-and-a-half years in, things have been implemented and the city is not going to hell in a handbasket, right? Obviously, we’re not perfect, but, I think that with anything, what I tell people about legislation is: the same way you can implement it, the same way you can roll it back. You can put something in effect and being responsible, you monitor it, and if things are not going the way you want, you can always make adjustments to improve on legislation, or to figure out ways you maybe curtail it. So that’s something that is a reality, so nothing is static. I think that what we’ve seen, in terms of everything, the muni-ID that’s been implemented, all the criticisms, nothing negative has resulted out of that - if anything it has been beneficial to the 500,000, 600,000 families or individuals that have availed themselves to it; or you think about all the unaccompanied minors, and us doing that public-private partnership, now we have over 100 children that were fleeing horrific crime, having asylum, and potentially more. We’ve done a lot of great things. Now the Criminal Justice Reform Act, where we have potentially 10,000 individuals that will not have these interactions that will produce a permanent criminal record - I mean that’s substantial stuff, and again, it’s validating and embracing people and communities that have been marginalized for so long; it’s trying to correct systemic injustices that have existed for too long. And these are the steps that we can take as a city - there’s obviously changes that have to happen at the federal level, but there’s things that we can do as a city and we’re demonstrating that, and it produces better results for the city at the end of the day when everyone feels embraced, when everyone is validated, when people are able to come back to their communities and reintegrate positively and be able to get a job. So those are things that to me mean a lot, and I’m very happy about what we’ve accomplished and what we’re accomplishing, what we have yet to do, and I think we’re proving the naysayers wrong. No one got hit hardest than myself during the Speaker’s race, I took a lot of hits, everybody analyzes that race in terms of all the negative reporting that was done, saying that doomsday is coming if I was elected Speaker, and I think we’ve been proving the naysayers wrong. BM: So two-and-a-half-or-so years into your speakershp, to the mayor’s term, you’ve obviously worked together on a lot of this because these things aren’t going to become law if they don’t go through the Council and get signed by him, so this is a pretty big, on the same page, joint effort about making a fairer city, more opportunity, you say correcting some of the inequities, so how do you see that right now? How has the work gone for two-and-a-half years? And are there specific things that you’re eyeing, that you say, ‘we haven’t gotten to this yet, but we have to move on this before I’m outta here’? MMV: I think we’re heading in the right direction. We have to put things in perspective, right, we’re dealing with a city as large as New York - so, bureaucracy exists - and we’re dealing with, prior to this mayor coming in, of 20 years of Republican rule, in essence. Bloomberg wanted to play footsie and be in two parties and was a Democrat became a Republican, independent, whatever it was - but in essence, it was Republican policies, and you don’t switch and turn that ship around overnight, and even two-and-a-half years in, it’s still a short window within a larger period of time, so I think that you are seeing some changes, and you’re trying to rectify and create greater balance where there was great imbalance; and certain communities felt it more than others. I believe we’re headed in the right direction. I believe the philosophy and the point of view - the perspective - that this administration holds, that which I subscribe to - we may have different approaches on how to get there, right, but in essence, if you’re talk about creating more equality and opportunity for communities that have been on the receiving end of these systemic injustices, then it’s going to take time. But, with all these things being implemented, at some point it all starts gelling and you’ll start seeing the rewards of that down the line. I think that we’re on the right path. We can always analyze it and do hearings and look at the statistics and look at the numbers, but in some of these cases, we’ve already started to see some of the benefits in that. BM: Being so on the same page, is the Council doing its oversight job well? There’s a lot of synergy - not just you, but the Council in general, most of the members, let’s say, with the mayor’s approach to things, and a lot of common ground. Has that subdued the Council’s oversight? MMV: No, not at all. I think there’s been issues, clearly, where we’ve been at really strong odds. In the budget negotiations there have been things that were not originally a priority of the mayor that we have gotten him to reevaluate. Just because something is not a public fight doesn’t mean that we’re not doing our job, right. There’s hearings, and there’ve been some hearings that have been contentious on certain issues. There’s also a lot of negotiations and conversations that happen outside of even the hearing structure. There’s conversations we’re having every day with the administration on different issues that come up. We put in our point of view to get them to adjust; conversations that we have with the NYPD; so there’s a lot of work outside of just the oversight hearings themselves that has led to changes, and has led to looking at things in a different way. We have had very aggressive hearings on different issues - the housing hearings; we also talk about NYCHA oversight, there’s been a lot of aggressive work we’ve done on that front - and on other issues...Rivington, we’re going to have the deed restriction hearing coming up soon. BM: That was popping to mind. I think we have about six different entities looking into that situation, with the DOI and the Comptroller’s reports already. MMV: I mean it gets a little crazy, so we wanted to at least let some of that work get done and then now with that information in hand, we have a responsibility to look at it and figure out if the changes that the administration is proposing are enough, or if we could go further. I was at the steps of City Hall with the borough president [Gale Brewer] and with [City Council Member] Margaret Chin to talk about the idea of having some deed restriction changes, lifted or not, to go through ULURP. So, there’s things that we are proposing that may not be exactly where the administration is heading - hoping to get to the same end result, but again, the path may be different in how we get there. BM: So on that, it’s fairly rare that you’re holding a press conference - you’re not a public sort of bomb-thrower when it comes, at least, to this administration. It seems like you have open dialogue, and as you just alluded to, the lines of communication are wide open so that’s happening in this building,in City Hall, on a very regular basis. What does that look like? Is that a lot of you saying to Joe [Taranto] and other aides, ‘you’ve gotta go talk to Emma [Wolfe]’? When do you pick up the phone or when do you walk over and knock on the mayor’s door? MMV: Obviously now with the summer, it’s a little bit of a lull. But obviously leading up to the budget and after the budget - the mayor and I have consistent meetings; we meet once every two weeks, once every three weeks. There are times when I call; obviously you don’t try to do that every day, right? There’s times when you want to engage the mayor directly, at least on issues, but there’s a lot of staff-to-staff interaction. If there’s something that I’m not particularly happy about or I have concerns about, the Chief of Staff Ramon [Martinez] will interact with the admin and his counterpart on the other side - so there’s a lot of engagement every day, I mean every day - there’s a lot of engagement that happens. I don’t hesitate, if I need to, to call the mayor and he’s very responsive too. So there is that level of respect. I’m not the kind of person, generally, that is a bomb-thrower. BM: Just with Donald Trump. MMV: Even with Bloomberg, I try not to personalize the issues. The difference is about the issue, I don’t try to personalize it. If I have a problem on a policy front or a direction that something is going in then I will definitely make it known. BM: Are there examples you can think of where you felt strongly enough to say, ‘I gotta just talk to the mayor about this right now’ - did that happen on the Uber thing, did that happen on horse carriages, did that happen at all during the MIH discussion? MMV: I’m not going to get into the details of conversations and when they happened, but obviously I do not hesitate and he’s very open to basically accept my call on any issue, and I appreciate that, and obviously it’s the same on the other side. If he needs to speak to me about something, we try to figure it out. BM: What kind of job is he doing? How do you evaluate how he’s doing as Mayor? You’re on the same page about a lot of things. I think at I would say at least a half-a-dozen press conferences he introduces you as his “partner in government,” right? I don’t know that you always use the same terminology, but he’s effusive, he seems to very much appreciate the working dynamic - but how do you think he’s doing? How would you evaluate him? MMV: Bill and I were colleagues here in the Council, so our relationship goes back a long time, so the respect goes back very far as well. So the partnership is strong because of that. I think that, again, I believe that what he’s proposing to do and what he’s been doing - which I think in some cases he doesn’t get enough credit for, maybe they haven’t done the best job of communicating it, right, whatever it is - but I really think that when you talk about, obviously going back to the pre-K, which is critical; when you talk about the muni-ID, which he joined us on; you talk about paid sick leave and creating those opportunities for people in the workplace; you talk about the changes he’s trying to make our educational system more fair and equitable, is key - I mean, I don’t have children in the public school system, I don’t have children period - but having been under eight years of Bloomberg, they were so quick to close public schools. The lack of resources and investment in schools; giving principals the tools to be able to get schools that were struggling to succeed - there was no investment in that, it was either well you succeeded or you didn’t, you walked away from the school - it’s a whole different philosophy now, where you have a chancellor that gets it, because she’s been through the system. They’re providing support, they don’t want to walk away from communities. It’s just a different vision and I think that it just brings so much more opportunity for those families and the children that benefit of it. The expansion of the community school model, which I love - I went to Cincinnati, I saw the success of it, I see how it works. I really believe in the idea that the more barriers you break down for a child to succeed the more that child will succeed. So when you talk about a child that can’t see because they don’t have glass or they need some sort of additional support, maybe they’re hungry at home - the more barriers you break down, that’s what the community school model is about and they’ve invested heavily in that. So, there’s a lot. The homelessness issue is obviously a big, big, big one that is not going to get resolved overnight. I think the lack of real attention and seriousness was not there before. So that’s going to take a while to really get out of that, but there’s been changes that have been implemented that really look more wholistically at the issue, and trying to meet people where they’re at, trying to deal with the issue of chronic homelessness differently than you do with the issue of a family that comes in looking for shelter temporarily. There’s more thought being given to it. The bringing back of a subsidy program, which is critically important. We have to challenge the private sector to accept those vouchers and to be more of a partner with us in allowing people an opportunity to have a permanent home. So there is work and challenges still there, but I believe that the way that they’re looking at the issue of homelessness and the crisis is very different and is much better, I believe. BM: Different from when they did the shake-up on it? Or you’re saying different from the Bloomberg era? MMV: Bloomberg in general. Again, what you’re talking about, a mayor that was there 12 years, and we had another eight years before that. When you’re introducing a whole new approach, it’s going to take a while, right, to kind of get that in place. And the struggle to make sure that nobody is left homeless and providing even temporary shelter when people need it is something that we struggle with and there are communities that reject it. There’s a struggle at the community level, where we need to find housing, emergency housing, where communities are pushing back against it. There’s a lot of work that goes into it. So, I think they’ve done some really good work in trying to have government be more sensible and sensitive, compassionate. We need that. BM: You said so many things there. The general theme was a lot of things that you’re encouraged by (MMV: Yes) and a lot of the things that you agree with, right? (MMV: Yes) So August 25th, I think we are, does he deserve re-election, would you say? MMV: Yes. He’s expressed he’s going to run for re-election and I support what he’s been doing. MMV: I know, it’s 59,000, the census, and to think an incredible number of those are families. It just continues to really reinforce the crisis of affordability in housing that we have in this city, and that this really is a priority for me. I’m working actively on getting that rezoning in my district so that we can create more affordable units. When you think that the majority - 28,000 of the 59,000 are kids; the majority of that 59,000 are families - it’s really troubling. But that really speaks to the crisis in affordability in this city, and that’s what we have to address. BM: So your district and your members’ districts come into play there in a big way (MMV: Yes). You mentioned your rezoning, there’s also the rezonings elsewhere. You mentioned sitings of shelters. So, is it your belief right now that people need to be able to say, ‘you know, these people have to go somewhere, if the administration needs to site a shelter, you’ve got to work with them’? MMV: Look, I believe the Fair Share reality needs to be really looked at. I think there needs to be more equity in the way that services are distributed. There are literally some districts that have no shelters in them. You look at one like mine, that we have probably over 2,000, 3,000 beds. So the issue of equity comes into the siting of services as well. And that’s a real challenge. When we’ve talked about the conversation about closing Rikers, of bringing services more locally to neighborhoods, because the people at Rikers are from our neighborhoods. There’s a resistance to that as well. 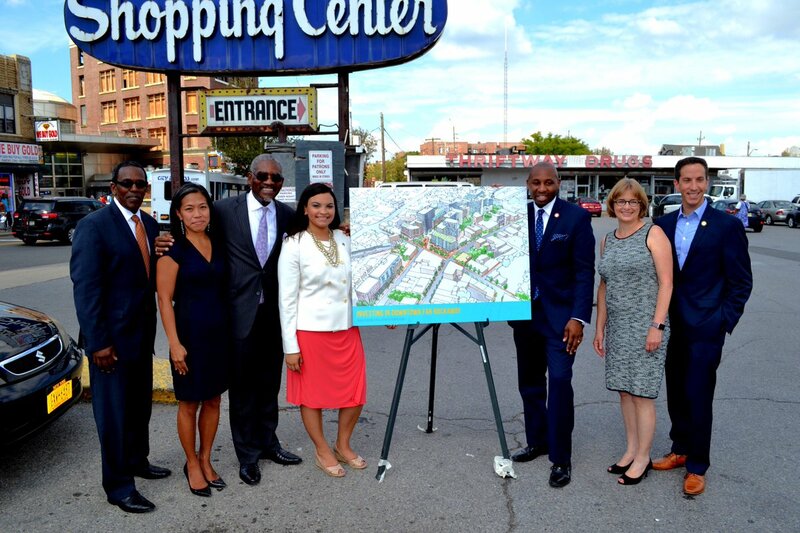 But, that’s the challenge that we have to put forward, to every community - that we all have a responsibility, right, to each other, and to making this city thrive and more equitable. And even about the conversation about the desegregation of public schools - what was happening on the Upper West Side, what was happening in Brooklyn - it gets to be a sensitive topic. BM: You mostly have seemed to stay out of those local flare-ups and local concerns, or is that not right? Whether it’s a community that doesn’t have a shelter being more receptive to one or it’s the school desegregation on the Upper West Side, is that something you largely think is sort of not for you to weigh in on in a strong way? MMV: I haven’t weighed in on those. On the issue of the siting of homeless shelters, we’ve actually had Democratic conferences with the commissioner of DHS at the time and we’ve talked about these things. We’ve brought the conversation locally to members and said, ‘you know we have a real crisis here and we have to really address this,’ and there may be some districts that push back against but that we really should be welcoming of it. And some members that are having pushback in their neighborhoods but are willing to push forward - I think Danny Dromm is an example of one; I think Daneek Miller was saying he was navigating those waters and he was getting some pushback, but he understood the importance of it. Sometimes I’ve had that in my district, too - initially there may be some resistance, but if it’s the right thing to do you have to come and engage your constituents and explain why you believe this is the right thing to do even though they may be opposed to it. And I have found that when you really engage in that conversation and take the time to really explain the process of your thinking and why, even if people don’t agree with you they’ll respect that, and you can work with your constituents and navigate through that. But it’s been a challenge, and on the issue of homelessness we’ve had this conversation at the local level with members, and pushing them and saying, ‘look we’ve got to do something about this.’ Because there’s some conversation happening now where some members are really pushing back. BM: And you mentioned Fair Share, that’s something you brought up in your State of the City, your most recent, is that an upcoming priority? MMV: Yeah, we’ve been doing some thinking internally, we’ve been analyzing this and figuring out what are the things we do (Ben: to update the Fair Share law?) Right. Some of that is dictated by the State, but we’ve got to figure out what are the things we can do as a city, and we have the authority to do to create some more equity. So we think that there’s some things - hopefully, we’ll be rolling something out soon, with some ideas, or a policy paper or something. BM: You mentioned closing Rikers. Is that - I know you’re waiting on your commission, I know Judge LIppman is working on that - but is that something that you really’d like to have a plan in place before your term is up? MMV: Obviously understanding it’s going to take a long time to get there, but I would like to, yes, have a blueprint that really has us kind of disinvest from what I think is already an outmoded way of looking at criminal justice, right, and again, these are people awaiting trial, they’re not guilty as of yet. So, sometimes people are unfortunately waiting longer than they should for those trial dates, and are sitting in Rikers. But the issue of bringing those individuals back to their neighborhoods, and keeping them somehow connected - to their families, to additional services - will have them reintegrate more successfully. I think that’s important, I think that’s in our best interest as a city, it’s more cost-effective. If we’re writing people off, there are societal consequences to that. We have to look at it from that perspective and humanize the issue a little bit, and that is the work that we have to do - to engage, it’s going to take a lot of local engagement to get to that point. But that commission that’s been convened is very committed. They all believe that there is a lot that we need to do. So I really look forward to it. At least before my next State of the City, we’ll have some recommendations on ideas that could be implemented. MMV: They’re part of the conversation, too. They’re not totally; they’re part of the panel, if I’m not mistaken, at least representatives. We sit in on the meetings, we’re not on the commission itself, but we do have people from the Council listening to the deliberations. But yeah, there’s a lot of work that’s going on and they’re [the administration] not removed from that. Hopefully we could arrive at a point of agreement; there’s a number of disagreements on that issue. BM: The mayor seemed to sort of warm slightly to it after his initial pushback, but you know, my estimation, looking at the calendar is: your term calendar, his re-election are gonna sort of collide (MMV: laughter) in a way that might make it challenging, right, for him. To me, if he’s gonna get on board with a plan to close Rikers, it wouldn’t happen until his second term, when he doesn’t have to worry about a re-election. MMV: Right. And maybe even longer. That’s not an easy thing to do. And obviously it has to be incrementally, there have to be steps taken. MMV: Right. There’s been different things that we’ve been looking at. No, but I’m excited, this is the legacy stuff. I’m going to be gone at the end of 2017 and there’s stuff that I want to leave in place, that I want to continue to have its impact, and that will have helped make this city more fair and just. And that’s really what I hope to do. BM: Alright, so let’s talk about that for a minute - unless you’re not going to say anything different than what you’ve said before. BM: OK, so how about this: I’ll throw a few things at you and you tell me your reaction to them, how they sound to you. MMV: No, that’s not on my radar. I think with the experience I’ve gained - obviously I value the work that our unions do each and every day - but in terms of the experience I’ve gained as a Council member, now as Speaker, I definitely want to continue to be influential in city politics. Meaning policy changes, conversations to that end. And figure out what that is - what is the right mix, what would the right role be, maybe it’s creating a role for myself, I have to think about it. Going into the philanthropic sector; whatever it is - you don’t know what life has in store. So, I’m not there yet, but obviously the people that are really important to me, and that are my mentors, that have kept me grounded, and give me guidance - I start throwing ideas about, look I’ve gotta start thinking about this. What would be the ideal role for me or situation for me. So I’m thinking about it - not spending too much time yet, but I’m starting to think about it. BM: So that means no Puerto Rico. You said stay involved in city politics. MMV: Well. You know, I don’t close doors. Again, three months from now you don’t know what opportunities may emerge, or months from now. I do feel very strongly that I want to finish my term. I know people keep throwing out there different ideas for what may be in store for me. BM: Well, I’m getting to the big question about the Clinton administration. MMV: Well I feel really strongly that with the level of influence that I have with this position that I can really help my district out, which is really, really dear and important to me. I have to figure out the best way that I can really leverage any support that I can provide to bring more to the district. So that’s important to me. But again, you don’t know what can emerge. Those are things that you have to think about and evaluate as they’re presented to you. That’s why I don’t try to be very fixated on any one point of view. I leave things open. BM: It’s still a ways out. BM: With the work you’ve been doing with the Clinton campaign, obviously you can’t blame people for some speculation, right? MMV: Right. But, what I will challenge is the idea that the only reasons I’m doing this is because I’m trying to leverage a position, which some people may have that point of thinking. That was never it. Again, if people know me and know who I am, I really support Hillary because I believe in her and I believe in what she will do for this country and what she can do for our city and what she can do for communities like the one I represent. And the issue of Puerto Rico is very, very much a priority for me personally, so I’m interested in having a President that is going to be a partner with the island and that is going to really make that a priority to figure out how do we help get Puerto Rico out of its situation. So, there’s some things there in terms of reasons why, beyond my personal self-interest. And I think that that’s one of the things I would push back on, when I hear that ‘oh yeah, she’s only doing this because...,’ right. Again, people that know me know that’s not who I am. MMV: I mean, because they come out - Eric [Koch] will tell me, ‘oh the polls came out,’ but I don’t really pay attention to that. BM: So the most recent Quinnipiac poll asks about your approval rating - 29% of New Yorkers approve, 23% disapprove, 48% don’t know or didn’t answer. Why do you think - Speaker of the City Council - that don’t know number, two-and-a-half years in - I assume, I didn’t look back, but I assume most of the time, a lot of New Yorkers polled just aren’t familiar enough with the Speaker of the City Council - why is that? What do you think? BM: Yeah, I think it’s polls of voters, but I think part of it is that even people who pay attention who vote don’t pay that close attention to city government. MMV: Right, and that’s why one of the things that we’ve done is, in looking at some of the tools we have available, is trying to figure out how do we make the Council more accessible to those that we represent. Creating more opportunities for people to engage through apps, sending us tweets, at hearings, and asking questions, or having the website be a little bit more accessible, more engaging, trying to take some hearings, we’ve done more of that than when I was a Council member, outside of the Council. And trying to figure out expanding participatory budgeting, creating opportunities for people to really get to know who we are. And I think we have a long ways to go, not only us, but everybody, but I’m still shocked every day, when I go to neighborhoods, way outside of mine, people recognize me and the work that is going on. Again, I don’t know about the polls. BM: Well, thank you for the time. MMV: When are you going to come to the district? BM: I'm going to come, we'll walk the district. On Thursday, a number of prominent advocacy organizations that have been pushing the Right to Know Act and criticizing Mark-Viverito over her compromise with Bratton held a Twitter rally calling for passage of the two bills with the hashtag #RightToKnowAct. Leading the call was Communities United for Police Reform, a coalition group of dozens of nonprofits. Organizations that lent their voices to the effort on Twitter include the Legal Defense Fund, the Center for Constitutional Rights, the New York Working Families Party, Justice League NYC, and Color of Change, among others.